Hey Everyone! Hope you are all well! Before I start this post I'd like to start off by saying a massive thank you to everyone who has commented on my blog posts recently. Unfortunately due to full time work I have been unable to sit down and just respond to everyone at the moment but I have read all of them and your kind words really do mean a lot to me. I promise I will get round to replying to them all soon but I just wanted to let you all know that your words haven't gone un-noticed. 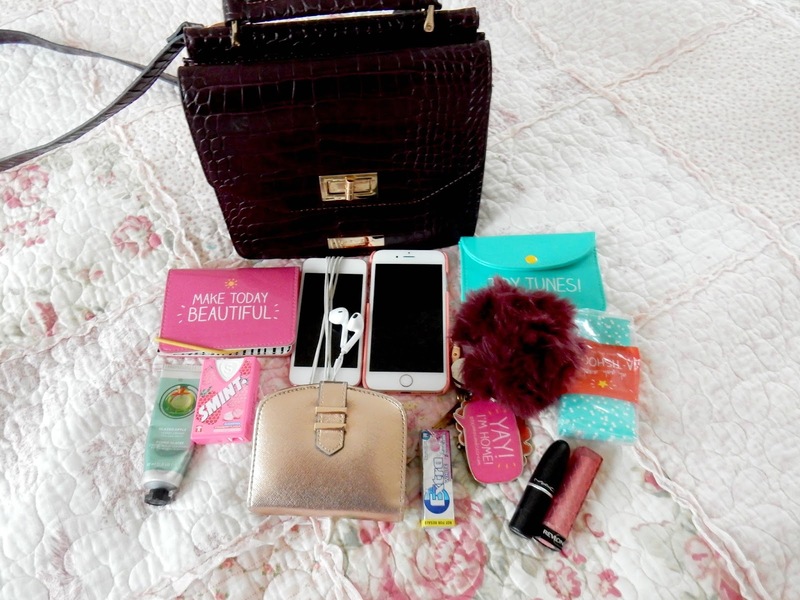 Today I thought that I'd do a post that I always love reading on other blogs and always enjoy writing and that is a 'What's In My Bag' post. I haven't written one of these in ages and to be honest I haven't really gone out and bought a new bag because I've been so busy working that I haven't even really had a chance to go out properly and shop! However I was watching the lovely Alix from ICovetThee on youtube and she did a video featuring this bag from Kurt Geiger and I fell in love with it instantly. Keep reading to find out why. 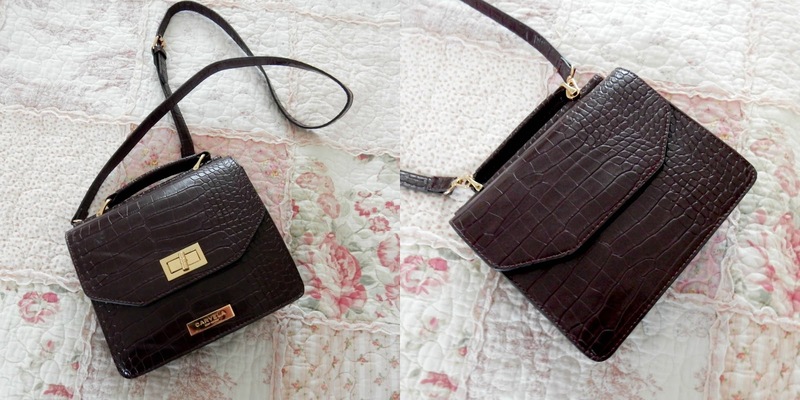 The bag is from Kurt Geiger and is the Frances Lock Croc Bag. It's no big secret now how much I love burgundy/wine shades for this time of year. It's my favorite color and I just love how autumnal and wintery the color is. I absolutely love this bag not just because of the color but because it's such a lovely size as well as being a cross body meaning that it is perfect for wearing across coats and jackets. Winter is that time of year where we are all wearing big jackets, coats and scarfs. The last thing we need is a big heavy bag to add on top of all that. I love that this bag is small enough to be a cross body but big enough to hold everything I need inside it. It's just ideal. As you can see from the photos about the bag has got two sides to it. The front which is fastened by a gold twisty type buckle thing (can you tell how good I am at describing things) is the more secure side and it's basically the front of the bag when you put your bag on. I tend to keep more of my most valuable things in this side of the bag. The back of the bag is also fastened by a snapper but I feel this is less secure than the front, obviously so I tend to keep all my less valuable thing in that side of the bag. Before I start getting into this post I did not take out or add anything to this bag for the sake of this blog post. The only things I removed were old receipts, tissues and coins which are now in my bag. Now that that's out of the way here are the things I tend to keep in my bag. iPhone: For reading blogs, tweeting away and taking a million instagram photos and snapchats! iPod Touch: For listening to music when I'm going to work or heading into London. Glazed Apple Handcream: I love this handcream from the body shop. Super moisturising for the winter and really do my hands wonders. Plus smells incredible! Smints: When you work with the public on a daily basis having nice smelling breath is a must! Purse: For holding all my cards and cash that I'll need on a daily basis. House Keys: Never a good thing when I forget them! Lip Products: My go to lipsticks for everyday featuring Revlon and Mac! Chewing Gum: Serves the same purpose as smints. Tissues: A must for the winter months as I get very sniffly. Headphones Case: I keep an extra pair of headphones in here and leave the case in my bag permantely as there's nothing worse then getting on the tube and realising you have no entertainment. Oyster Card: Can't get to work without this! Bring on the day I pass my driving test. Small Umbrella: I live in London...need I say more? Portable iPhone Charger: I have an iPhone. Therefore it's a must! Snacks: In case I feel a little bit peckish. I'm loving the little graze snack boxes at the moment! Small Bottle Of Water: To keep hydrated whilst on the go. I never really drink enough water so now I'm trying to drink more every day, It's just so important! A Book: At the moment I'm reading 'I Heart Christmas' by Lindsey Kelk and I absolutely love it. There we have it. A sneak peek into my bag. I know these posts are not everybody's cup of tea however I also know how nosey some of us are and how we love taking a peek inside of other's handbags. If you are interest in this bag then just click HERE to read more about it. The bag normally comes at a pricey £69.00 but it's currently on sale for £31.20 which is what I got it for. I find that amazing for how good a bag this is. It comes in two shades as well, the wine shade that I got and a black color which might be more appealing as it'll go with everything. Apart from the essentials do you keep any unusual things in your bag? 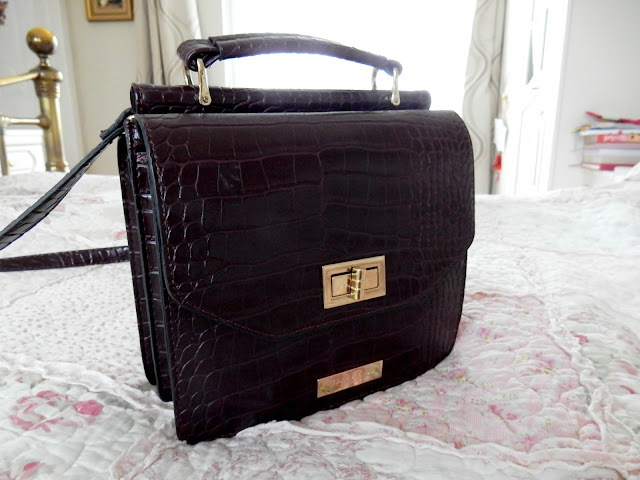 Definitely one of my fave posts to read - that bag is gorgeous for this time of year!